If there is one thing the recent Paris riots teach us, it is the cliché ‘easier said than done‘. President Emmanuel Macron has been the torch-bearer of advocating climate change buffering by cutting the use of fossil fuels right from the moment he set foot in Elysee Palace. The 2015 UN climate conference held in Paris negotiated the Paris Agreement setting the goal for limiting the global warming to well below 2-degree Celsius compared to the pre-industrial levels. Out of the 196 countries who had signed the agreement, 176 has ratified it. The US, under Obama, used to be a tireless exponent of limiting global warming until Trump came over and repudiated the science of climate change as hoax in 2016, elucidating the purported ‘ very big political agenda of scientists’ ( though in two years time he replaced the definitive tone of it being a hoax to his acknowledgment that he was not sure if it was manmade or not). He pulled back the US from the Paris Agreement recently, making it clear that he ‘does not want to give trillions and trillions of dollars or lose millions and millions of jobs and put the US at a disadvantage’. Skepticism to climate science is rife among most of the far-right and even far left ( like the new Mexican President, Andres Manuel Lopez Obrador). The 2015 per capita carbon dioxide emission share of countries show the US as the second largest greenhouse gas emitter after China. India closely trails in the third place. While climate change is pure and simple science and the occurrence of frequent extreme weather events like the California wildfire, droughts, floods and hurricanes in many other parts of the world are forewarnings of many more in future, for an average person to absorb this abstract, unseen global phenomenon is not that easy and it might seem unreasonable for many. It is hard for one to relate driving a diesel truck for a living to a flood or drought in another continent ( predominantly so in a scenario where global leaders themselves talk dismissively of global warming, questioning how on earth could snowfall occur if the global temperature was shooting up). Even for the educated and informed ones, there is an element of cognitive bias at work while encountering abstract phenomena like global warming for which no cognizable evidence could be provided in terms of an immediate cause-effect relationship. Macron seemed expeditious in tackling the problem by imposing a carbon tax that would have seen the price of diesel, petrol, and coal soar upwards, curbing old diesel vehicles from plying the roads and a host of other measures. The fact that these measures would exclusively batter the poor hard-working majority of rural France was passed over, deliberately. A blue-collar worker, who had already been struggling to put a square meal a day on his plate, who has paid the highest tax from his meager income while Macron lavished tax cuts to the elites, could be forgiven for not imbibing the cause-effect relationship theory of climate science. Macron’s grandstanding attempts at the cost of the poor and favor for elitism is all too patent for one to ignore. Discontent and disillusion have been smoldering among the French right from the time he acceded to the throne, only that it reached a boiling point now. The social media, particularly FB, has played a huge role in simmering the discontent and helping organize this unorganized revolt with its platform for venting emotions and feeding rage. France, the wellspring of many illustrious revolutions that toppled dynasties and even world order, is on fire once again. Though vandalism of historic monuments like the Arc De Triomphe and the public property is untenable, the fire on the streets is too intense and burning for Macron to ignore. He has since then taken a sharp U-turn from his proposed tax measures after an affected intransigence initially, but the point at issue has already reached a new high and protestors are coming up with new demands for a pay hike, pension revision, educational reforms and so on. The picture is an atavistic reversal to the pattern of all the French revolutions to date except that it lacks a definite leader, party patronage or manifesto exactly like the student protests of 1968 and the banlieue riots of 2005. There seems to be no other way for Macron but to yield to their demands or else quit his throne. He could even be forced to negate the tax cuts previously bestowed on the elites. Such is the power of democracy that the other leaders who are watching the events with trepidation will no doubt be more expedient in proposing environmental laws from now on and many could even join the league of climate change deniers and skeptics or be more in cahoots with the fossil fuel lobby citing the French example. And the common man is not to be blamed if he gives preference to his short-term existential goals to long-term climate change statistical extrapolations. Unless some improvement in his circumstance or lot happens, whether it be living a decent life or moving up the social ladder, he is justified in opposing what to him seems like draconian measures to tamp him further down the socioeconomic strata while the rich and powerful clamber up the ladder by stepping on his back. Macron has finally begun to take stock of this but learned that the hard way. The formidable French general Charles de Gaulle who became president in 1959 was one who was not afraid to make controversial decisions. Despite his inflexibility and intractability, he was nearly toppled by student and worker protests of 1968 and resigned from power the following year. Science akin to religion is an archetypal iceberg with a small superficial floating part that is visible and comprehensible to most and a huge deep submerged part perceivable to an esoteric minority. Metaphysical and religious preaching about the ways to envision the God to a hungry man is useless when the only thing in which he sees his God is a loaf of bread or a person providing it to him. Likewise, Macron would do well to appease the common French citizen giving his ear to their needs first before lofty goals. Over a steaming cup of tea, I was foraging my wonted hunting ground on the newspaper, when my eyes alighted upon a queer creature with a cute, dainty calf beside it. Zooming in my hazy eye lens, I started fumbling about in the dark of my foggy cerebrum to track it down to the depths of the memory warrens, but all in vain. After having embarked on a short stint in Bsc- Zoology at Mar Ivanios College during the nineties which had lasted only for one short month till the medical entrance results came out, subsequent to which my professed grip on the subject could in no way, shape or form be embellished beyond the morphology of cobra, rattlesnake and Russel’s viper lying in state in their eternal sleep within formalin jars or the ticks, mites, and lice spread-eagled on glass slides under the microscope. Ever since that time, I had cloaked the yen for the exotic mien of a Zoologist in secrecy, at times putting on a pedagogic air exhorting my lad to make peace with the roaches, that rise like zombies during those hushed inky nights, from the languorous underbelly in the artful arthropodous section of his Biology text, but in the long run laying bare my primal fear and sending the roaches fleeing in the pandemonium of diabolic screeches. Slowly but surely, the whiff of entomophobia started to sink in, crumbs of zoophobia crept in, the winged spirit of inquiry sent flying, naked truths dawned in, that I would never have had cohabited with the critters of the animal kingdom where roaches are the gatekeepers. Thus, even the last embers of interest been snuffed out, nothing animalic held any more allure outright. Such has been my humor when I caught sight of this picture, yet so much queerish the mother doe appeared, all the more so with her baby calf, stirring the curiosity up once again. A wild goose chase inside the braincase having miserably misfired, I trained my eyes on the fine print and rummaged through the details. Let me disclose the name of my protagonist – Okapi, a.k.a forest giraffe. 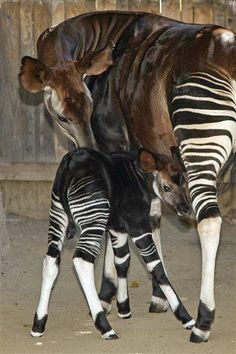 Classified as endangered and so adopted by zoological centers and bred to ensure propagation, its head is similar to a giraffe sans the long neck, the body akin to a horse with velvety soft fur while the rear end features horizontal white stripes of a zebra, a mishmash of sorts, the Creator’s plan gone awry. I am not confabulating about the chimerical fire-breathing hybrid beasts of mythology or the ominously seductive mermaids of folklore( No, not yet demented). Such an amalgamation do exist, indeed! And it has nothing to do with giraffes, horses or zebra. This particular Okapi in a Zoological Centre( in the middle-east) has hit the headlines, not for any wrong reasons, but for bringing forth its calf, endearingly named, Kito meaning “precious child” in Swahili. They are strict vegans and registered in Okapi Stud Book, a global record of all Okapi’s in the world. Breeding is done through the guidance of a stud bookkeeper to ensure the purity and viability, marriages are arranged. Reading the quote of the fledgling Zoologist,a western dandy, seemingly an incipient rookie( his photo abutting the Okapi picture, a clean-shaven foppish face sporting a hipster retro sunglass with a splashy flashy smile, apparently overpowered with that archetypal sprightly fervor when as a new father, one gets to hold the bundle of joy from the midwife), I couldn’t help but ponder the very many reasons why these Arabs prefer Occidentals to Orientals for zoological jobs. But then, times are changing, this is the 21-st century. China is planning to send a few artificial moons to space to light up its night sky( earnestly hope other superpowers wouldn’t follow suit, lest the night sky will give way to a perpetual daysky), mars tourism brochures are already in print, early birds being offered some discount of sorts, provided they get the booking done directly from Musk’s office( marketing strategies in full swing there too!). So, who knows, by the same token, this hunk of a Zoologist could well be equipped with an audacious pretentiometer rivaling our dear old quivering potentiometer(Freud might well be laughing his head off inside his grave). I quit, Zoology is not my cup of tea, still, the thrill-seeking lift of enlightened self-interest is hard to cast aside and the allegorical drift in the adjectival string of verbiage, unwitting though, is even harder to shrug off. ‘Mon Cher Zoologist, I do now fathom the bottomless word, decipher the nuances of its connotation, see through its vignetted monochrome, that a creature thus majestic cannot but shed its vainglory and like so this plebeian bids adieu to that proudish legacy of yore’.